The second visit to Europe was fleeting as we were ready to go home. Greece has a lot to offer although we did not see a lot. The Plaka area of Athens is lovely for a day of pottering and an evening of fun. Also Olympia is worth a visit. Italy is just wonderful. Traveling through the central highlands was interesting. Perugia is a fabulous place - don't miss the cathedral. San Gimignano is a great place for a few days and Florence (Firenze) - well, you can't go to Italy and miss out Firenze. Oh, the pizzas and the Chianti !!!!!! Getting on to the boat from Haifa to Pireas was quite exciting. Punda was raised on to the deck and we parked up in a position we thought would not be affected too greatly by the wind. There we waited for a few hours until the boat set sail. A few other vehicles arrived including that of Martin Mes from Holland who is doing an incredible 6000 km charity run raising money for diabetes research. When we parked up we didn't realize the location next to the engine would be such a nuisance. In fact everything about the boat was a nuisance and it was seriously lacking in luxury - our barge from Wadi Halfa had more charm and facilities. The grand tour of the boat took about three minutes, most of which involved working out how to use the lifeboats. By the time it was dark the ship was off. The night was terrible. The engines kicked out a considerable amount of noise and fumes which guaranteed an uncomfortable sleepless night, despite ear plugs! The day that followed wasn't much better. After a top tuck on the deck we thought it would be an ideal time to catch up with some work on the laptop. Well, the lounge was the only place with electricity and where the noise level was low enough so that it didn't send your head bounding. However the lounge was the venue for church services - all five hours of them but we sat quietly in a corner tapping away. Once they were over the videos of Jerusalem started. We had to unplug the lappy for the TV and plugged in around the corner. Then we were told to unplug again as the lappy was interfering with the booster on the video. What a load of codswallop - but try to teach logic to a Greek bartender - forget it. So the afternoon was pretty miserable with the thump thump of the engines and us not able to do anything right. By the time it got to bed time we shifted the car somewhat which made a little difference. When we booked the ferry we paid an extra $40 to guarantee our position on the deck as we were told that it was likely to be full. There turned out to be only six cars! Also we were told that there would be two stops and we'd arrive in Pireas on the 23rd. Well on the morning of the 22nd the stop at Rhodes did not happen and the GPS suggested that we would arrive in Pireas in about six hours. Hurray. Couldn't wait to get off the boat! There is just nothing I could praise the shipping line or boat about. This journey was the worst boat trip I have ever made and I will never chose Poseidon Lines again. Before getting off the boat we had to pay 3000 drachmas - for a form for customs - but no other explanation could be obtained. So at the port we handed in the form to customs and drove off. That was it. No checks, no passport control, no questions. No-one was interested in us. We could have brought all sorts of illegal items into Europe. Within a few minutes of leaving the boat we were cruising around town not knowing where we were going because we didn't have a guide book or map. Pireas's bookshops could not help so we continued to Athens where within the hour got hold of a copy of Lonely Planet's Mediterranean Europe. 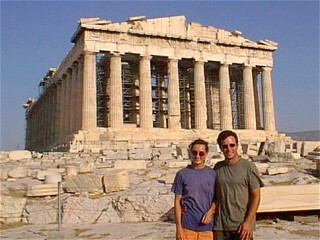 An hour after that we were ensconced in Athens Camping just outside of town. Here the facilities were adequate and the noise level somewhat lower than the ferry. On the 22nd we thought we'd leave the car at the campsite and travel around Athens on public transport. It was just as well as it was a car free day around town and buses were free. Hurray. Soon we were in the centre of town and headed to the National Archeological Museum. Our student cards got us in for free - hurray for fake ID! I must admit that the items on show did not have the same effect as in other museums. Somehow Greek history doesn't have the same appeal as Egyptian history. However, the Egyptian rooms were just great. Afterwards we went on walkabout following a route suggested in the LP guide. The cafes around Plaka were just great as we passed through on the way to the Acropolis and the weather was beautiful as we strolled around the sites. The Acropolis and Pantheon amused us for a while - at half price using our student cards. So far we had saved £12 in one day! Some of the marble decorations were stunning. 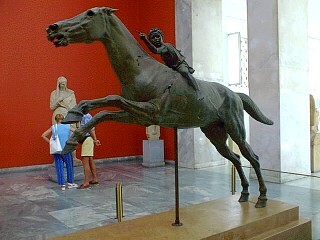 Below is a representation of what would have been at the top of the Parthenon. The evening was beautiful as the sun set and the lights were turned on around the various small streets. We had a few beers whilst catching up with some very amusing British newspapers. After dinner of moussaka, dolmades, Greek salad and disgusting Retsina (rude not to) we watched' The Gladiator' at an open air cinema. It was the perfect setting for such an excellent, but gruesome film. By the time we'd had a coffee we were too late for a bus so negotiated a price for a taxi. The first drivers wanted 5500 Dr but then we found a good one and the meter read 980 DR by the end of the journey! A busy morning followed. It was time for washing the clothes and the car; stocking up with food and water and heading off to Patras to book the ferry to Italy. We had initially planned to travel around Greece but the islands weren't an option with having a car and the northern areas didn't have much that appealed. In Patras the Blue Star ferry seemed the best deal and with ferries leaving on a daily basis we didn't have to book until we were ready. Instead we went off south and found a very pleasant place for a bit of bushcamping. In the morning we were up early and spent hours and hours driving around the most beautiful back roads. Autumn was on its way and the colours were stunning. By mid-morning we had arrived in Olympia and paid a visit to this historic site - apt as the Sydney Olympics were on at that moment. Olympia is in a beautiful area and a tour of the ruins was very interesting. The other sites in the Peloponnese (area of land to the south-west of Greece) were a long way off and we couldn't justify traveling 600 km to see things that we really weren't that bothered in seeing so we decided to head towards the beach and find a campsite for an afternoon of fun. It wasn't long before we found Paradise Camping which at 3000 DR was good value. Our pitch next to the sea was great and after a brief swim in the Med - very cold compared to the Red Sea - we had lunch and ensconced ourselves in the hammocks with a few beers and a large bunch of grapes. Sheer indulgence. By morning we were ready to move on and within an hour had reached Patras. The ferry ticket cost 27,300 DR (about £50) for two people and a car to Brindisi and by 1pm we were on the flagship 'Blue Star 1' en route to Italy. The journey took 9 hours and was fabulous. What excellent value - a complete contrast to the Poseidon Line from Israel. The boat was new and had every facility you could wish for - swimming pool, two cinemas, shops, restaurants, beautiful food and loads of comfortable seating. The time went so fast. We caught up with two films, had a delicious meal in the restaurant, sunbathed on the deck, bought some duty free chocolates and watched a bit of the Olympics on the satellite TV. Brindisi arrived too quickly! As soon as we were off the boat we were plunged into relative darkness and had to drive around looking for somewhere to camp. It had already gone 10pm and most places were closed so we were unable to ask directions to a campsite. We couldn't find a site so pulled over into an olive grove and had the most blissful nights sleep in ages. In the morning other car tracks around us indicated that we had been seen and investigated. Neither of us had woken up to the sound of the car! As we weren't sure if this was private land we sneaked off quickly in the morning and headed onto Lucce. What a beautiful place, full of alleyways and incredible architecture. We had cappuccino in a stand-up cafe with the locals, bought speciality Lucce bread and amused the locals with our dreadful Italian. The remainder of the day was spent driving north through the beautiful mountains. Progress was not fast as we chose to avoid the tolls on the autoroutes and take back roads instead. A combination of roadworks and valleys slowed us down but the scenery was worthy of such a slow viewing. There was a conveniently placed picnic spot where we decided to camp. The ranger came over to see us but I pretended not to understand what he was on about (not a place for camping) but we bombarded him with our Africa trip in pigeon Italian and that soon sent him on his way. Gosh it was cold overnight. We were up in the mountains and were shivering in the 11ºC temperature. We listened to the radio over breakfast which is something we rarely did because of usual poor signal quality. News of a Greek ferry disaster was coming through. Thankfully we had mobile phone signal and were able to phone home and pacify the relatives. At last, on the 28th we reached a town which was on our itinerary. Perugia is on the top of a hill so you park your car at the bottom and take escalators up into the main town. The exit of the escalator is within an old fortress and you are immediately thrust into a medieval town. The architecture is wonderful - decorated windows and doorways, balconies and shutters. The streets are mostly cobbled but a few cars come along - mainly taxis - which interfered with the gazing. Our first 'visit' was to the San Servo church which displays Raphaels "Trinity with Saints". Entry is 3000 lire and we expected a grand church with a number of paintings. After paying our money we turned around and that was it. The single room was tiny and the mural almost filled one wall. The ticket also allowed us to visit the "Pozzo Etrusca" which is a very old Etruscan well. The Doumo was fantastic and we both walked around with our mouths open in sheer amazement. 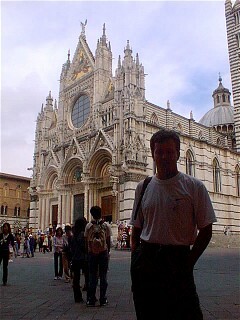 We had seen some sights in Africa but the absolute grandeur of this Italian cathedral was something else. Paintings, murals, sculptures, coloured glass, candles and gold treasures just create an atmosphere of indulgence and it was staggering. 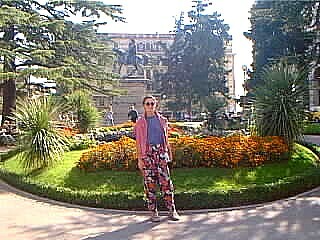 Outside was the Fontana Maggiore which is a beautifully sculpted fountain and worthy of a good look. We had a brief look around the National Gallery but it wasn't really our thing. Our visit to Perugia took longer than expected so we decided not to push on to Siena but to make early camp next to the lake at Castiglione de Lago. We inflated the inner tubes and took ourselves and our beers for a float on the lake. Talk about being chilly in the water. Not quite the temperature of the Sea of Galilee or the Dead Sea! After a warm up shower we put on our posh togs for once and went out for dinner at a most delightful restaurant (La Cantina) in the town. Fabulous pizzas and a rather large carafe of Chianti went down a treat. 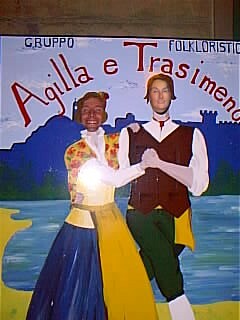 Oh to be in Italy again! Siena wasn't as appealing as expected but that was probably because we dashed around having parked illegally as the car was too tall to get into the parking garages. San Gimignano, on the other hand was beautiful. It is an old city famous for its bell towers and is located in the middle of the Tuscany countryside. Artists were positioned at the best locations for painting landscapes, people played instruments as tourists wandered through the narrow streets looking at the fabulous displays in the delicatessens and wine shops. After a pizza and wine lunch we visited the Museum of Torture and almost threw the lot back up. The museum displays various items used to torture people, shows photos and drawings of various acts and gives vivid descriptions of torture techniques. I have never been so horrified in my life and we both left the place almost trembling and feeling physically sick at what we had seen. While we were in the museum it started to rain - the first rain since Ethiopia which was months ago. Oh no, that's the start of it, we thought. That's the end of the trip. The rain was to continue for days and our visit to Florence involved dashing between the National Gallery (exhibits of 'David' by Michaelangelo and Donatello), the Museum of the History of Science and the Ponte Vecchio with our giant Land Rover umbrella (a gift from my chums). This was our second visit to Florence - the first time it was covered in a layer of ice! We can highly recommend the pizzas at Le Colannine on Via dei Bena (near Santa Croce). They must be the best in Italy. That night we heard about fighting between the Israelis and Palestinians in Jerusalem. It seems recently that we depart from somewhere just before the troubles start. The continuous rain and the cool temperatures tempered any enthusiasm to camp or see any more of expensive Europe so we decided to make a dash for home. 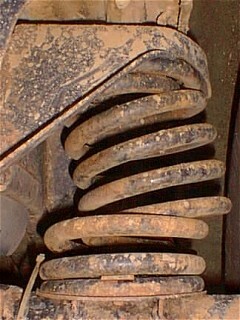 Also our broken spring was holding on strong but we were not sure how long the luck would last. Within a few hours we were up in the Alps having traveled along the autoroutes and paid for the privilege. Tolls from Florence to the Frejus Tunnel amounted to huge amounts of money and then followed by charge of £15 for the tunnel. So we entered the tunnel in Italy and exited in France. Surprise - more tolls, but at least the diesel here is cheaper than in Britain. Not a lot that was exciting happened in France as we just traveled north following autoroutes. Our last night of the trip was spent camping behind a service station. After such an adventure the end was not very fitting. In Calais Punda was loaded up further - with French fuel in the jerry cans and with beers and wines in the back of the car. We had a lovely dinner at a bistrot in town before joining our SeaFrance ferry to take us back to Blighty (cheaper if you book over the telephone - no. 0990 711711 or travel after 8.30pm). Straight through customs - with no MOT and no road tax (We had booked a temporary MOT beforehand so that if we were stopped we could say that we were on our way to have the car tested). Just a brief look in the passport by security and we were off, driving on the other side of the road in the dark and thankfully too late for the traffic jams on the M25. Within a couple of hours we were back home where we were greeted by friends who had stayed up late to welcome us back with a bottle of bubbly. Strange feeling! A mixture of relief because of the comforts now available to us but also great sadness - the trip had finally reached its end. It has been a fabulous adventure through Africa: The people; the landscapes; the cuisine; the cultures; the religions; the ideals; the hopes; the wildlife; the friends; the good times and the excellent times. But also the struggles; the lack of what we consider to be basic facilities and services; the poverty; the frustrations; tribal divisions; corruption, extreme weather conditions and the desperation...etc. It's a complex mix and that's why it is so fascinating. We are very privileged to have been. Despite 18 months and 74,664 km on the road in Punda, the familiarity of home made it feel as if we had never been away. Next "???? - We'll have to wait and see"
The Greek food you get in Greek restaurants in London is just the same as that you get in Greece. However, you cannot match the pizzas in Italy with anything else.